Real GDP declined at an annual rate of 1% in the second quarter of 2009, according to the BEA's advance estimate. America's new-found frugality continued to be a drag: consumption decreased at a 1.2% rate, even as real disposable personal income rose at a 3.2% pace (presumably thanks largely to the tax cut). Investment continued to fall - nonresidential investment declined at a 8.9% rate, and residential (i.e. housing) at 29.3% (!). Exports fell at a 7% rate, much better than the 29.9% rate of decline in the first quarter. On the positive side, GDP was boosted by declining imports (down 15.1%) and increased government purchases (up 5.6%). Declining inventories showed up as a negative in the GDP numbers (by itself accounting for 0.83 percentage points of the 1% decline), but may bode well for the future as businesses may decide to increase output to re-stock. Today's numbers came with a comprehensive revision of the entire GDP series. This changes our picture of the past a little bit. Validating the NBER's call of a business cycle peak in Dec. 2007, the new estimates have GDP declining at a 0.7% pace in the first quarter of 2008, compared to the previous estimate of a positive 0.9% growth rate (GDP did tick up in the second quarter of '08 - possibly with some help from the first stimulus, Floyd Norris reminds us - before beginning a sustained decline in the third quarter). Overall, the revisions make the recession look even worse, as the first three quarters of 2008 and the first quarter of '09 were all revised downward (though the fourth quarter of '08 was nudged upward). For the contraction that lasted from the fourth quarter of 2000 to the third quarter of 2001, real GDP increased at an average annual rate of 0.1 percent in the revised estimates; in the previously published estimates, it had decreased by 0.2 percent. The BEA is also revising its nomenclature: the "advance" estimates will now be followed by "second" and "third" estimates, rather than "preliminary" and "final." A further reminder, I suppose, that no estimate is ever truly final. [S]ome folks are cheering today's news. Reminds me a little of how I've seen people in Minnesota take off their shirts for the first 40oF day of spring, a little shocking to a traveler from San Diego. Zubin Jelveh highlights the "automatic stabilizer" role of declining imports, though Barry Ritholtz notes its hardly a sign of health. Josh Bivens and Dean Baker argue the numbers show the stimulus recovery act is helping. Real Time Economics rounds up the reactions of prognosticators. Update (8/1): Andrew Samwick looks at the composition of GDP, which highlights the role that declining investment has played. I would add that the 11.2% share of investment in the 2nd quarter of 2009 is the lowest ever in the data series going back to 1947 (mainly due to housing, nonresidential fixed investment was 9.9% of GDP, which is lower than average, but not alarmingly so). At 70.6%, the share of consumption is the highest ever - even though consumption has fallen, output has fallen more. Will Green Shoots Rise Quickly? [A] strong Asian recovery is visible, with output, employment and demand all following V-shaped trajectories, and regional industrial production rapidly bouncing back above the previous peak. Yet this recovery is dismissed by western analysts, who appear unable or unwilling to believe the region is capable of endogenous growth. That 2009 will be the second year in a row in which the increase in Chinese domestic demand exceeds that of the US is a point roundly ignored. [F]ew commentators consider the possibility that the large post-Lehman rise in US unemployment was a mistake on the part of panicky managements. Yet this is precisely what trends in labour productivity growth, not to mention common sense, tell us occurred. In the first half of 2008, labour productivity growth averaged 3.3 per cent, while the unemployment rate rose to 5.6 per cent. At that point, there was no evidence US companies were overstaffed. Thereafter, output collapsed, yet business productivity growth remained positive, registering an average yearly pace of over 2 per cent, as companies shed labour at a faster pace than they reduced output. Businesses, like markets, panicked after Lehman went under. Employment and output were both reduced far more than it turned out to be necessary, as businesses temporarily and understandably assumed a worst case scenario. Just as global output is performing a V-shaped recovery, there is a big risk US employment will do the same, with monthly payrolls showing surprising growth by the end of 2009. Usually, employment changes less than output during recessions - following a regularity known as Okun's law - which means that labor productivity falls. This recession appears to be breaking that pattern. Brad DeLong recently offered a more pessimistic interpretation (see also Robert Waldmann's response to DeLong). While the widespread expectation of a 'jobless recovery' is consistent with the slow recoveries from the previous two US recessions in 1990-91 and 2001, Bond also notes that, historically, deeper recessions have been followed by sharper recoveries (a point I also made here). For example, 1983-84 was a particularly strong period of growth, coming out of the deep 1981-82 recession. His article comes to my attention via Time's "Curious Capitalist" Justin Fox, who writes: "I find that awfully hard to believe, but perhaps that's because I work in an industry struggling with some major secular troubles as well as cyclical ones. In any case, it'd sure be fun if Bond turned out to be right." 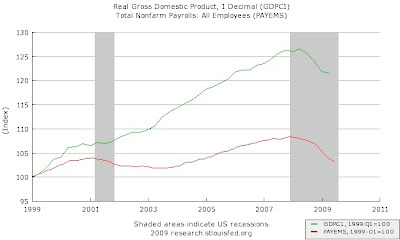 Update: Krugman points out that Okun's Law looks better after the latest GDP revision. The prevailing view was that the truly dangerous financial crisis would be one produced by the unwinding of "global imbalances"--a collapse in the dollar and a panicked flight not toward but away from dollar-denominated cash--that could not be handled by the Federal Reserve because in such a crisis the assets that it would create would be assets that nobody wanted to hold. [T]here has been a major adjustment. The question is whether it will be sustained when the US recovers and US demand picks up. That depends on the course of the dollar, to be sure. And of the course of the dollar depends on whether private demand for US assets picks up, as well as whether countries like China maintain dollar pegs. But it also depends on the nature of the global recovery – and the strength of stimulus policies other countries adopt. And their at least there is a bit of hope, at least so long as China sustains its current highly stimulative policies. China’s June surplus was lower than expected, in part because China’s imports picked up before China’s exports. That’s goods news for global adjustment. There sometimes is a tendency to speak about the world’s macroeconomic imbalances as if nothing has changed. That increasingly strikes me as a mistake. The world’s imbalances haven’t gone away, but they have shrunk dramatically. Japan is now running an external deficit. China’s surplus shrank, at least in q2. The US deficit is much smaller now than in the past. Europe’s internal imbalances also have shrunk. The adjustment came the painful way – with sharp falls in exports and imports. But it was still adjustment. The trade deficit fell sharply. The rise in the public borrowing buffered an enormous fall in private borrowing, and private demand. It cushioned rather than stopped the adjustment. The challenge now is try to make sure the recovery doesn’t undo the adjustments that happened during the crisis. The editorial leader in this week's Economist examines "what went wrong with economics." As an economist, I regularly encounter misperceptions about what we do - when I tell people what my job is, they often ask me for predictions and investment advice. And if that's what people believe we do, than its not surprising if the financial crisis has diminished their respect for economists. In its crudest form—the idea that economics as a whole is discredited—the current backlash has gone far too far. If ignorance allowed investors and politicians to exaggerate the virtues of economics, it now blinds them to its benefits. Economics is less a slavish creed than a prism through which to understand the world. It is a broad canon, stretching from theories to explain how prices are determined to how economies grow. Much of that body of knowledge has no link to the financial crisis and remains as useful as ever. Macroeconomists also had a blindspot: their standard models assumed that capital markets work perfectly. Their framework reflected an uneasy truce between the intellectual heirs of Keynes, who accept that economies can fall short of their potential, and purists who hold that supply must always equal demand. The models that epitomise this synthesis—the sort used in many central banks—incorporate imperfections in labour markets (“sticky” wages, for instance, which allow unemployment to rise), but make no room for such blemishes in finance. By assuming that capital markets worked perfectly, macroeconomists were largely able to ignore the economy’s financial plumbing. But models that ignored finance had little chance of spotting a calamity that stemmed from it. There is some truth in that, but the tendency to ignore the "plumbing" reflects the fact that writing an economic model - reducing the behavior of six billion crazy people on a stochastic planet to a system of equations - is, by nature, an exercise in simplification. Simplication is useful, and many of the most important insights come from the simplest models (e.g., the Solow growth model and the Krugman trade model). The goal of economic model is to gain insight into how the world works, which is not the same thing as making theory "realistic." That said, I think they are right, in the separate macroeconomics article, to warn: "Economists can become seduced by their models, fooling themselves that what the model leaves out does not matter." However, the solution is not - as they seem to think - in introducing more complexity, but in keeping a proper perspective on the inherit limitations of the economic modeling exercise. Nor can economists now agree on the best way to resolve the crisis. They mostly overestimated the power of routine monetary policy (ie, central-bank purchases of government bills) to restore prosperity. Some now dismiss the power of fiscal policy (ie, government sales of its securities) to do the same. Others advocate it with passionate intensity. Among the passionate are Mr DeLong and Mr Krugman. They turn for inspiration to Depression-era texts, especially the writings of John Maynard Keynes, and forgotten mavericks, such as Hyman Minsky. In the humanities this would count as routine scholarship. But to many high-tech economists it is a bit undignified. Real scientists, after all, do not leaf through Newton’s “Principia Mathematica” to solve contemporary problems in physics. They accuse economists like Mr DeLong and Mr Krugman of falling back on antiquated Keynesian doctrines—as if nothing had been learned in the past 70 years. Messrs DeLong and Krugman, in turn, accuse economists like Mr Lucas of not falling back on Keynesian economics—as if everything had been forgotten over the past 70 years. For Mr Krugman, we are living through a “Dark Age of macroeconomics”, in which the wisdom of the ancients has been lost. The lasting legacy of the new classical economists is the methodological shift towards models based on microeconomic foundations, such as contemporary Dynamic Stochastic General Equilibrium models. However, the "policy ineffectiveness proposition" which seems, still, to reflexively guide some of the "purist" new classical thinking reflects the mistake of taking models too literally, forgetting about the simplifying assumptions made along the way. While Keynes (and the "textbook" distillation of Keynes into the IS-LM diagram) is full of methodological holes from a today's point of view, the crisis has provided numerous reminders us of how brilliantly insightful he was. See also the reactions of Menzie Chinn and Mark Gertler, who both believe macroeconomics is doing better than some of the critics give it credit for. House Democrats have proposed an income surtax on the highest wage-earners to help pay for a sweeping overhaul of the nation’s health care system. The proposal, which has little support in the Senate, would generate roughly $550 billion over 10 years. Cincinnati panhandlers would have to pay a fee to register, pay earnings tax on their collections and toss their hand-written “Please Help” signs under a plan to be proposed next month. Saying panhandling is as much of a business as, say, selling hotdogs, Councilman Jeff Berding is working on a plan he says will help make the city more appealing to residents and tourists. Development depends on good governance. That is the ingredient which has been missing in far too many places, for far too long. That's the change that can unlock Africa's potential. And that is a responsibility that can only be met by Africans. The speech got mostly good marks from Paul Collier, Bill Easterly and Chris Blattman. One of the difficulties of assessing macroeconomic policies like the fiscal stimulus is that doing so requires comparing the performance of the economy with a "counterfactual" - what would have occurred in the absence of the policy. Of course, we do not really know the counterfactual. 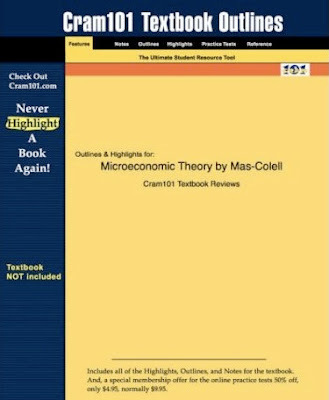 Reliving the traumas of the first year of graduate school, I stumbled upon this: A "Cram101 Textbook Outline" of Mas-Colell, Whinston and Green?!? Veterans of economics PhD programs will realize that is a strange idea - who would ever conceive such a thing? While Mas-Colell could stand to be shorter (and lighter! ), I can't imagine how it could be "condensed" - if it were any more dense, light might not escape from it. Hmmm... I am curious to see what might be inside, but for now I'll stick by my recommendation of Varian's book (and, surreptitiously, its baby brother) for anyone seeking to start out on graduate microeconomics. In the contemporary money culture, to be at leisure, to be idle, is to be irrelevant. After Bank of America acquired Merrill Lynch, John Thain, the former chief executive of Merrill, was pushed out, in part because he insisted on going skiing at Vail over Christmas and wanted to attend the World Economic Forum in Davos amid the company’s continuing crisis. A great many people can afford not to work and could spend their time shuttling between multiple homes, eating fabulous meals and playing golf. Yet they continue to work around the clock. Of course, the private jet, the BlackBerry and the Internet allow people to do all of the above. But among Type-A, self-made members of the leisure class, there’s a sort of reverse prestige associated with leisure. At Davos, which is filled with conspicuous consumers, the only people who ski are the journalists. Veblen, who died in 1929, saw a large overclass that earned most of its wealth through returns on capital. Essentially, their money made money for them. Which gave them time to hang about and conspicuously consume. In the period after his death, that overclass shrank substantially, first because the Great Depression battered them and then because the New Deal disadvantaged them. But by the start of the 21st century, they were back. At least in terms of wealth concentration. Their money, however, wasn't coming from capital returns. It was coming from wages and salaries. They were -- gasp! -- working. In accordance with Section 421 of the Trade Act of 1974, we have determined that imports of certain passenger vehicle and light truck tires from China are being imported into the United States in such increased quantities that they are causing market disruption to the domestic industry producing such tires. Under Section 421(f) of the Act, we have the responsibility of recommending actions that will remedy the market disruption. We have considered the relevant factors set out in the statute, the written and oral submissions of all parties, and other information obtained in the investigation. To remedy the market disruption caused by rapidly increasing subject imports, we propose that the President, for a three-year period, impose a duty, in addition to the current rate of duty, on imports of certain passenger vehicle and light truck tires from China. This duty would be 55 percent ad valorem in the first year, 45 percent ad valorem in the second year, and 35 percent ad valorem in the third year. In our opinion, these tariff levels would remedy the market disruption that we have found to exist. See also this Reuters story. The recommendation next goes to the President. Recalling that Obama's views on trade were somewhat murky during the campaign, Greg Mankiw suggests his determination in this case will be revealing. "This Chinese tire case may be one indication of the president's true feelings about trade." A better way to protect industries adjusting to increased competition would be through the increased use of "safeguard tariffs," a type of trade barrier that is explicitly temporary. Increased use of safeguards may fall short of the free-trade ideal, but they cost the U.S. economy far less than do antidumping tariffs. (When tariffs are in place for more than three years, the WTO allows countries whose exports are affected by the safeguards to levy retaliatory tariffs.) Like antidumping duties, safeguards can be put in place only if the ITC determines that specific imports are hurting a domestic industry. The legal hurdle for getting a safeguard, however, is higher: unlike antidumping tariffs, which can be levied when imports merely cause material injury, safeguards are permissible only when the ITC finds that no other factor is more important than imports in causing harm to a U.S. industry. In return for the higher standard of injury with safeguards, import-competing firms in the United States do not have to show that the foreign firms took any particular actions. No consideration is given in safeguard determinations as to whether trade is fair or unfair. The law governing safeguard tariffs also gives the president an opportunity to balance the needs of the import-competing community against the interests of the rest of the country. Although the ITC issues a recommendation, the president, according to the legislation, has the discretion to impose trade barriers as he sees fit, balancing "the short- and long-term economic and social costs" of the safeguard tariffs with "other factors related to the national economic interest of the United States." And in return for trade barriers, the domestic industry must put forward a plan for adjustment and show progress in making the adjustment--or face the prospect of having the safeguard tariffs removed by presidential action. The authors of that article? Greg Mankiw and Phil Swagel. While it will be interesting to see how the President deals with this, it would be a stretch to proclaim him a "protectionist" if he follows the ITC's recommendation.